In Maui County most residents drink water to which the country’s number one restricted use pesticide has been added prior to being piped into our homes. This is a common practice across our state and throughout the country, and it is healthy for us. Treatment of domestic water with chlorine and related compounds is done to meet safe drinking water standards. Chlorine is a restricted use anti-microbial pesticide that can be toxic and even lethal at high concentrations, yet is routinely used in domestic water treatment facilities by experts trained in its safe use and it comes out of the faucet at very low levels that are considered safe for humans. It is also used in wastewater treatment facilities to limit the spread of microbial pathogens. 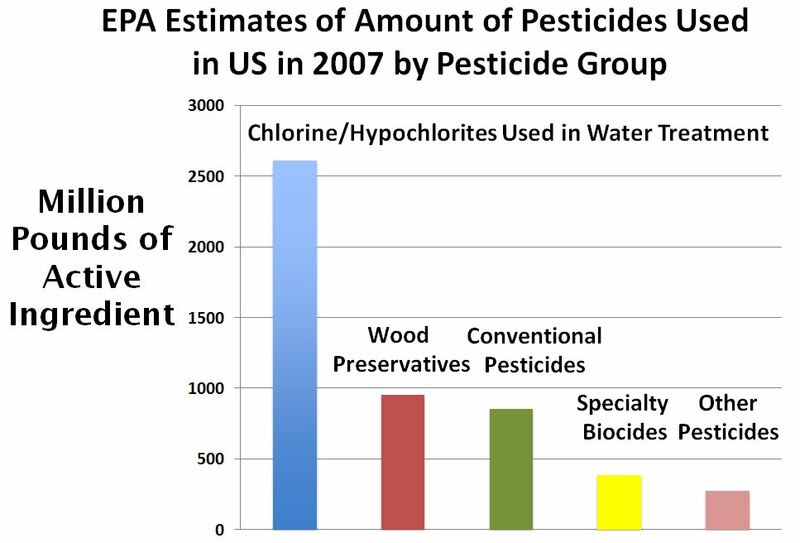 Chlorine (and related hypochlorites) accounted for an estimated 51% of all pesticides used in 2007 according to the EPA, far more than other pesticide groups including agricultural pesticides included in the conventional and other categories above. At the proper dose, chlorine keeps us safe from some nasty microbial contaminants in water that otherwise could make us very sick or worse. The Centers for Disease Control and Prevention notes that while the chlorine and related chemicals could be harmful at high concentrations, the low level added to water kill germs is still safe to drink. An average concentration of 0.5 parts per million of residual chlorine is found in drinking water and the maximum allowed by EPA is 4 parts per million. Before cities began routinely treating drinking water with chlorine (starting with Chicago and Jersey City in 1908), cholera, typhoid fever, dysentery and hepatitis A killed thousands of U.S. residents annually. Drinking water chlorination and filtration have helped to virtually eliminate these diseases in the U.S. and other developed countries. Today we take for granted that our domestic water used for drinking, cooking and bathing will be free of microbial pathogens. The EPA recognizes certain risks from disinfection by products in some circumstances, but they are far outweighed by the benefits of pathogen-free water. Recently, the Hawaii Department of Agriculture reported the sales of restricted use pesticides (RUP) for 2014. 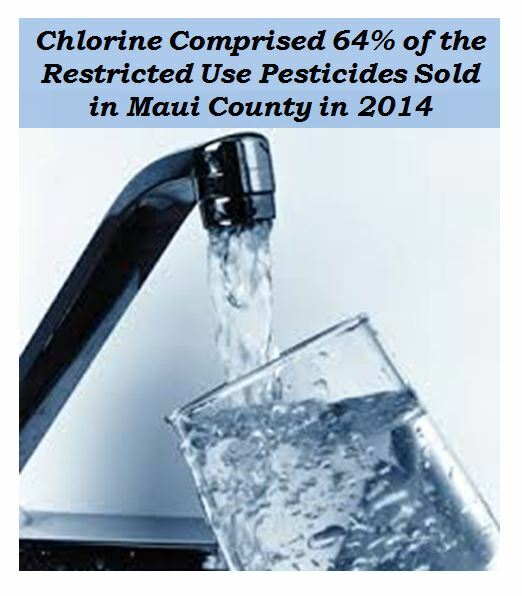 Chlorine accounted for 51% of statewide RUP sales in 2014, and it accounted for 64% of all RUP sales in Maui County, far more than agricultural pesticides. This did not result in protests, parades, county council bills or ballot initiatives to ban chlorine from being put into our water because chlorination is familiar and perceived as effective. Everyone is familiar with how unpleasant some microbes can be, so we accept a low dose of a pesticide to eliminate this threat to our health. Hardly anyone though (about one percent of the US population) is farming commercially and familiar with agricultural pesticides. Those who are familiar with them know that like chlorine they are also used in small amounts to great benefit when used in a safe manner as intended. Clearly we need to have a perspective on all pesticides that recognizes more than just they are hazardous. Many things are hazardous (electricity, automobiles, and power tools) but we are continually learning how to minimize their actual risks while enjoying their benefits, just like with adding chlorine to make our water safe. Pesticides Industry Sales and Usage: 2006 and 2007 Market Estimates. A. Grube, et al. Biological and Economic Analysis Division, Office of Pesticide Programs, Office of Chemical Safety and Pollution Prevention, U.S. Environmental Protection Agency. Washington, DC 20460. February 2011. Summary of Restricted Use Pesticides Sold in 2014. Plant Industry division, Pesticides Branch, Hawaii Department of Agriculture. Water: Basic Information about Regulated Drinking Water Contaminants. Basic Information about Disinfectants in Drinking Water: Chloramine, Chlorine and Chlorine Dioxide. U.S. Environmental Protection Agency. Water Quality and Health, Drinking Water Chlorination: A Review of Disinfection Practices and Issues. The Water Quality and Health Council. Guidelines on Rainwater Catchment Systems for Hawaii. 2010. P.S.H. Macomber. University of Hawaii Manoa, CTAHR. Chlorine Basics. 2008. Pamphlet 1, edition 7. The Chlorine Institute, Inc.
Wastewater Technology Fact Sheet: Chlorine Disinfection. 1999. Office of Water, U.S. Environmental Protection Agency. The Dose Makes the Poison. Assessing Toxic Risk: Student Edition. National Science Teachers Association. Cornell University.